DEAR BART - aka Mr. Stressed Out: I imagine anything is possible, and that saliva could stain granite. But my instincts tell me the stains are temporary. Not all granites are equal. They are as varied as grains of sand on a beach. Different granites have varying chemical and crystalline makeups. These characteristics make them react differently when water soaks into the micro-pores of the granite. One thing this observation of yours illustrated is that liquids can soak into the polished faces of the granite surface. Here is my own Brazilian Verde Peacock granite bar top. 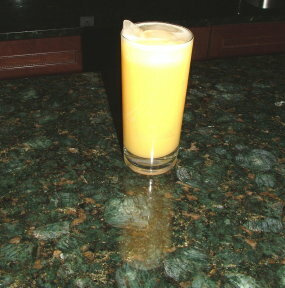 This glass of orange juice looks pretty harmless, but the ice will eventually create condensation and a glass ring. A further danger is the citric acid in the orange juice. Who knows what it might do to unsealed granite? The air pressure pushing on the suction cups exacerbated the situation. The 14 pounds per square inch +/- pressure on the other side of the granite from the cups pulled the saliva and moisture deeper into the granite. If saliva was just placed on the top of the polished granite, the air pressure on each side of the granite is the same, and surface tension might minimize the depth to which the saliva would penetrate into the granite. But when you apply a vacuum, the saliva can be pulled deep into the granite. The moisture of the saliva causes light to refract differently and this is why you see a dark spot. Once the granite dries, the dark spot usually goes away. Sealers help to block the pores and micro-cracks in the granite so water and oils sit on the surface. Stains become permanent when the liquid can't leave the granite.Oils are one such liquid. They can be very difficult to lift from a granite surface. This is one reason pizza boxes should never be placed on a granite top. Oil can soak into the cardboard box and then pass into the granite. If the worker had just spit out a wad of chewing tobacco or been eating some spaghetti with tomato sauce, then there is a chance his saliva contained colored molecules that could stain the granite. If this is the case, the granite supplier probably has special cleaners that can be used to remove the stains. One thing is for certain, do not seal the granite until the surface is stain-free. Sealing the granite could lock the stain into the stone permanently.